SPRINGFIELD, Mass. -- The next time you look up GOAT in the dictionary, Tom Brady's face just might be there. Merriam-Webster has added more than 840 words to its dictionary, among them the word that has become synonymous with the New England Patriots quarterback's unparalleled success. GOAT is defined as "the greatest of all time: the most accomplished and successful individual in the history of a particular sport or category of performance or activity." 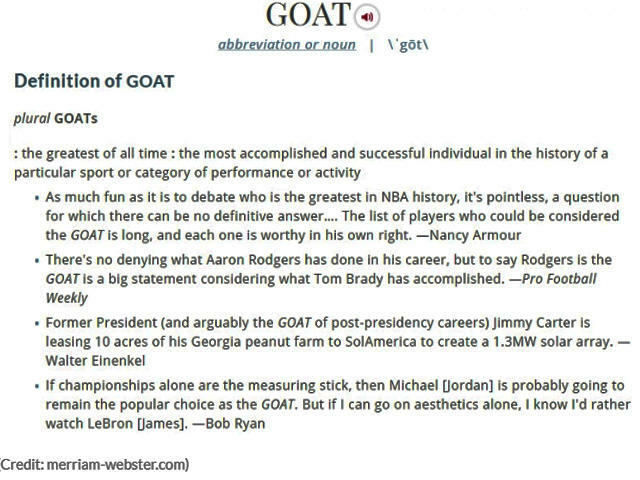 The Springfield-based dictionary offers up an example of GOAT used in a sentence that mentions Brady. Folks, it's that time again. "There's no denying what Aaron Rodgers has done in his career, but to say Rodgers is the GOAT is a big statement considering what Tom Brady has accomplished – Pro Football Weekly." Other new words announced by Merriam-Webster include abbreviations like "marg" (short for margarita), "fav" (short for favorite) and "bougie" (short for bourgeois). New food and drink entries include a beer "flight," "zoodles," "mocktail" and "hangry." There are also new words concerning identities. "Generation Z" has been added to describe people born in the late 1990s and early 2000s, and "Latinx" is a gender-neutral alternative to Latino and Latina.